Hotel Presidential is a luxury hotel situated in Port Harcourt. It provides amazing and excellent services to guests at competitive rates. Guests at Hotel Presidential enjoy beautiful scenery while taking a walk around the hotel. It is in proximity to some very interesting places such as Port Harcourt City Mall and Port Harcourt Tourist Beach. Hotel Presidential can be located at Aba Road, GRA Phase II, Rivers, Nigeria. The guest rooms at Hotel Presidential are tastefully furnished to ensure that guests are provided with a luxurious and comfortable experience. Guest can pick a room from the following luxuriously designed room categories: Garden Premier, Garden Executive, Family Suite, Premier Deluxe, Junior Suite, Senior Suite, Executive Suite, Luxury Suite, Royal Suite, Governor Suite and Presidential Suite. 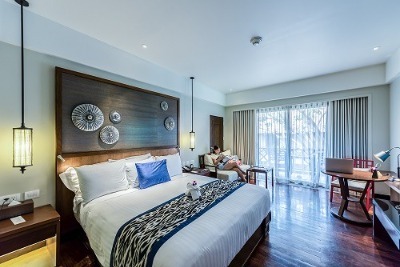 The air conditioned rooms are fitted with soft king-sized beds so guests can have a blissful rest with no body aches in the morning, an en-suite bathroom with a shower and bath, cable connected TVs for guests to watch their favourite channels, a study desk for reading and catching up with work. Guests need not worry about looking for a venue where they can host gatherings as Hotel Presidential has an event venue to host events of all types. Tennis lovers can also indulge themselves in a game or two at the tennis court. Training, presentations and seminars can be held at the onsite conference centre. Relaxing swimming sessions can be had at the pool. Fast and free Wi-Fi connection is available in the rooms so guests can stay abreast of what’s happening around the world. For special business support needs that guests would like to resolve, a business centre is available to take care of such needs. Hotel Presidential has a restaurant that serves guests nourishing meals prepared under strict hygienic conditions. The bar is fitted with wines, cocktails and other alcoholic and non-alcoholic beverages. Guests can mingle with others at the lounge while having their drinks. For fitness enthusiasts, a gym is available for guests to have workout sessions. There is also a night club where guests can unwind and have loads of fun. Hotel Presidential offers additional services such as laundry/dry cleaning, 24 hours front desk, concierge, luggage storage and 24 hours room service. Ample parking space is available on the premises. Security guards are available to guard the hotel premises. 24 hours security is also provided for guests comfort. Q: Does Hotel Presidential provide laundry services? A: Laundry services are provided on request. Q: Does Hotel Presidential have a Wi-Fi facility? A: Guests are provided with free Wi-Fi access in their rooms. Q: Is there a pool at Hotel Presidential? A: A pool available onsite where guests can have a relaxing swim. Q: Does Hotel Presidential have a gym? A: There is a gym where guests can have workout sessions. Q: Does Hotel Presidential provide guests with room service? Hotel Presidential is a luxury hotel in Port Harcourt, Rivers. My stay at the Hotel Presidential was awesome. I had a great time there, the hospitality was good. I must commend the waitress Nkem, she treated us really well. The rooms were clean . I honestly had a nice time there. My stay in the hotel was nice, their food taste good and the I.T person Mr. Anthony was pro-active in his service to me. My phone, internet and my television were not working for 20 minutes after checking in but he sorted all out, I profoundly commend him. Though the hotel is good. I can never go to this hotel again, very expensive and not up to the standard. My room wasn't comfortable, water dripping everywhere in the rest room. Although, the staff were okay and location was perfect. My room was on the 7th floor, there was no hot water and the air conditioner was leaking. My calls to the front desk to get the hot water issue resolved took forever. My overall assessment, is that the hotel is a big disappointment. The maintenance is poor. The services in 1998 when I last stayed at the hotel, has really nose-dived. The current management should do something in this regard. Have nice pictures of Hotel Presidential?